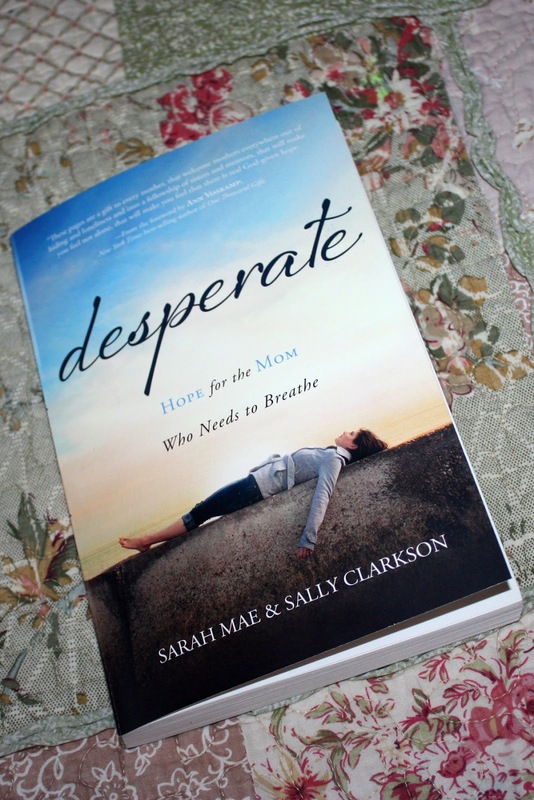 Tomorrow there is a fantastic new book being released called Desperate: Hope for the Mom Who Needs to Breathe. Along with many other bloggers, I was given the opportunity to read the book ahead of time in exchange for an honest review. So here it is! I honestly can’t even tell you how it happened, but a few months ago I started receiving emails of blog feed from a woman named Sarah Mae. I don’t remember ever actually going to her blog, let alone signing up for emails, so it must have been a God thing because they appeared right when I started needing them the most. Each email was short, but always incredibly in tune with what I was going through at that time with my kids. After a few months when I heard that Sarah Mae was writing a book I couldn’t wait to read it! Especially once I heard the title – “desperate” and “needing to breathe” describe perfectly how I feel almost all the time. I needed to read this book. Desperate is written mostly for mothers with young children. Mothers who are often lonely, frustrated, angry, and overwhelmed. Women who feel like even though they love their children, they’re trapped in a very hard life that doesn’t seem to have an end in sight. I am definitely one of those women. I really enjoyed the format of this book. Co-authored by Sarah Mae, a mother of three young children, and Sally Clarkson, a mother of four adult children, they each had a very interesting perspective on not only getting through the early years of motherhood, but also making the most of them and truly enjoying life rather than just getting by day by day. The chapters are relatively short, focusing on a single problem at a time, making it easy to understand without getting overloaded by information and ideas. The first section of Desperate is about accepting your role as a mom and realizing that you’re going to need help. Help from God, help from your husband, help from friends. You don’t need to go at it alone and you’re not expected to. I loved the first section of this book because it gave me the amazing affirmation that I really am not alone! There ARE other people in the world that are going through the same things that I am. For me, it’s so hard because I’m pretty isolated. As a stay at home mom who isn’t involved in much of anything besides staying at home, I don’t get much chance to talk to other moms. It was such a relief that these authors, especially Sarah Mae who is going through these things right now, understood me. I’m not crazy! I also enjoyed how this section validated the need for “me time” and time for friends. Sometimes I feel so guilty because all I want to do is get away. But when I have those breaks I come back feeling so refreshed and calm and ready to tackle the next day with enthusiasm instead of dreading it. Sally Clarkson stated it like this, ” Having a friend who shared my ideals was essential to my own well-being and the emotional health of my family.” What an accurate statement for my own life as well. One of the things I really liked about this book was how the authors give you the freedom to simply do the best you can without worrying about formulas or fitting all of your children in the same box when it comes to learning or discipline. I was so relieved by this because I’ve gone to classes and listened to webinars and read books in the past that swore if you did something a certain way your child would turn out right. Granted, Caden is only four, but so far none of those “proven methods” have worked for us. Which only made me feel like more of a failure. Desperate helps you to truly understand each of your children and their unique differences and how you can adjust to their needs, rather than expecting them to fit into the box you’ve designed for them. This idea really touched my heart as I realized how often I expect Caden to behave exactly how I want him to. And how much I’m harming both of us by my unrealistic expectations. He’s four! Shepard is still only one! How can I expect so much from them when I’m such a sinner too, making so many mistakes of my own on a daily basis? It’s only been a week since I read this particular statement, but I’m trying to live with this new idea of “offering them loads of grace and affirmation, so that they can be confident that we get it and we are on their team.” I want to be a safe place for my kids. I don’t want them to think that I’m always going to be mad when they mess up. Who would want to be around somebody who is constantly condemning them when they’re only trying to find their place in the world? Certainly not me. The second section of Desperate focuses on more practical applications to making your life and home a happier place. The authors offer plenty of ideas for evaluating your needs and attending to them before you become too desperate, keeping up with housework, and giving encouragement for enjoying your children instead of always pushing them away. This idea has really clicked with me. I realized how much I depend on other people to make me happy. I think that if Greg doesn’t do this or that I have reason to get angry and not talk to him for days. If Caden is especially crabby I have no excuse not to be crabby myself. If nobody ever asks me to do anything with them then I must not be worth anybody’s time. But that’s not true! I have power over myself. I have responsibility to myself. It’s nobody else’s job to take care of me and make me happy. If I want to do something I should do it! If I want to go somewhere during the day with the boys, even if it’s farther away than normal, we should do it. If it’ll make us happy and bring joy to our otherwise somewhat mundane lives, why not? I love this idea and hope to start applying it to my own life so much more in the future. There was an underlying theme in this book that I wasn’t expecting, but have really enjoyed thinking about. Both authors, though particularly Clarkson, have built their homes with the intention of bringing warmth and beauty into the lives of their families. I was surprised by how much attention they paid to this idea throughout the book, but I loved how validated it made me feel. Sometimes it feels like buying new decorations for my home, trying to celebrate little holidays in special ways, lighting candles every night, etc. is just such a waste. Does my family even appreciate it? Maybe it doesn’t seem like it, but at least according to the authors, they will as they grow. They’ll learn to love and appreciate beauty and warmth and the happy memories associated with a warm and inviting house. And if that candle and those decorations make me happy, won’t that make them happier as well? I hope to take this message, as well as all the other great ideas in this book to heart, changing my soul and my attitude to love and accept my boys, being the best mom that I can be. I want to live intentionally, take responsibility for myself, and create a happy home for my family while they’re still here to enjoy it. I highly recommend this book for any young mom out there looking for a little encouragement!